Long ago, the peaceful and pleasant heart of England formed a continuous forest. At some stage, humans must have set foot upon the area of land that would come to be known as 'Oddingley', in the midst of the great Feckenham Forest whose remnants still remain, and begun to clear space for dwellings and fields. The earliest known mention of Oddingley village is in a document from 816, when England was still divided into separate kingdoms. It was in that year that the services of the manor in Oddingley to the King of Mercia, a kingdom roughly encompassing the land occupied by the modern-day Midlands, were officially defined. By then the village was already part of the diocese of Worcester. In medieval times the worship of God was central to every English person's life. Although the land of Worcestershire was just as pleasant and beautiful then as it is today, life would have been simpler but less certain. Most people, of course, worked the land, and felt a stronger connection to the seasons of the year and the soil beneath their feet than many people do today. If the weather was poor or work was done badly and the harvest failed, the village would face starvation. Being uneducated, it would have been difficult for people to make sense of the world around them. Hence, because they were so strongly connected to God's creation and so explicitly dependent on the luck of the weather and their ability to persevere with hard work, everybody would have felt especially in need of the encouragement, structure and comfort provided by the Church, which alone provided hope and meaning, in times of difficulty and of plenty. We might therefore expect a church to be amongst the first constructions erected as the village grew. We cannot know when this building first arrived at Oddingley, but an early, wooden church was explicitly mentioned in 1288, as a dependent chapel of St Helen's church in Worcester. 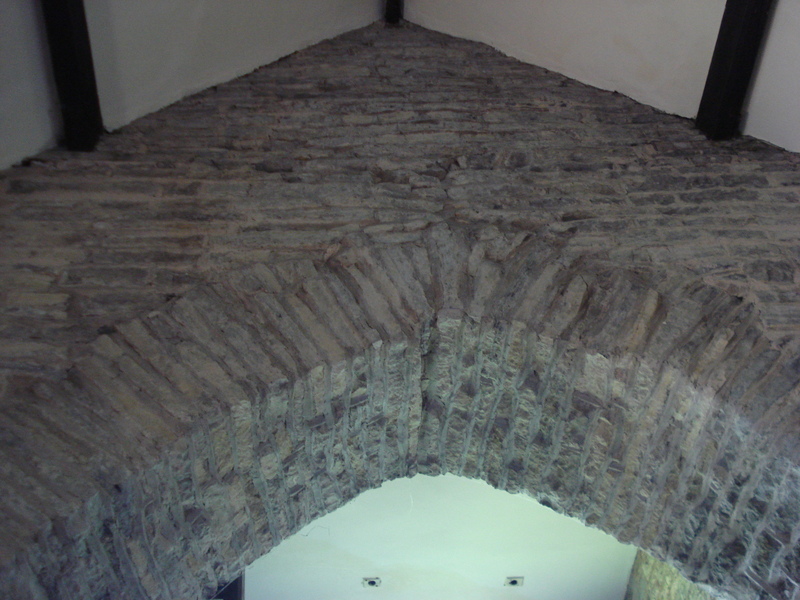 In the fifteenth century the wooden construction was replaced with the current stone building, constructed from limestone that was probably quarried nearby. Originally there was no tower, but the wall at the back of the nave was removed and a tower introduced in the seventeenth century. The original west window, shown at the top of this page, was preserved during the construction and fitted into the west wall of the new tower. The church was used throughout the next few centuries, as the parish passed between numerous owners including the wealthy Mortimer family, the House of York, the Tudor King Henry VIII (who gave Oddingley manor to Catherine of Aragon), the Wintours of Huddington and the Galtons of Hadzor. The church building, however, was neglected, and began to fall into disrepair. In the mid-nineteenth century, a visitor described how the walls were split and the windows broken. Under the Galton family, the decay was at last rectified. 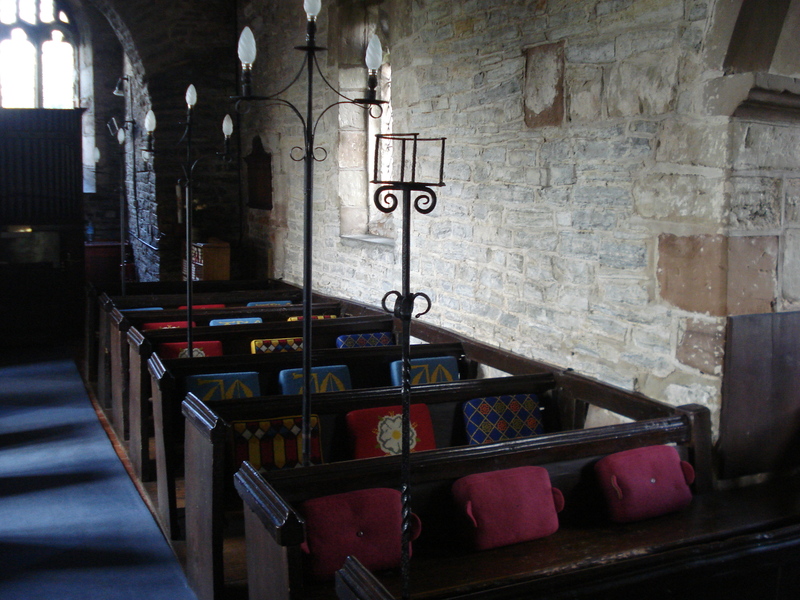 Much of the stonework was rebuilt, particularly in the chancels. New pews were created, reusing some of the wood from the older ones they replaced. 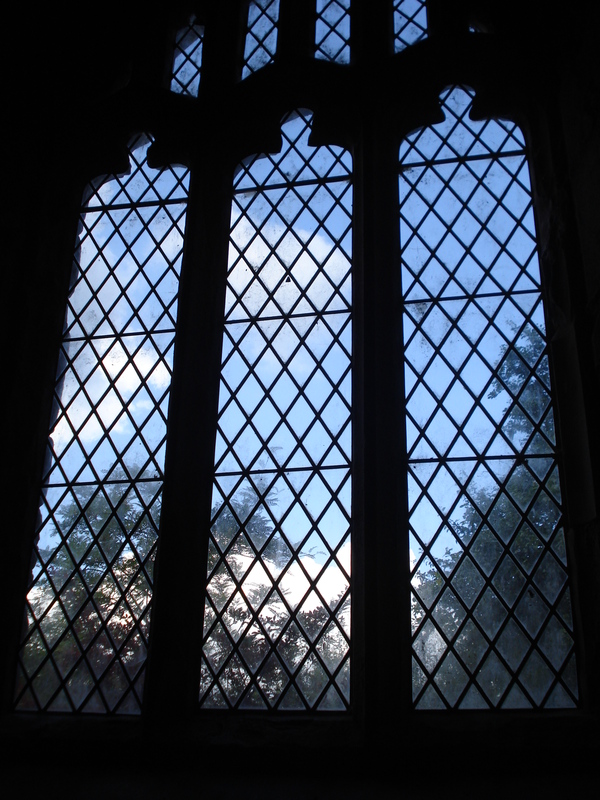 Many of the windows were preserved or restored, including the beautiful East window, and others were introduced. 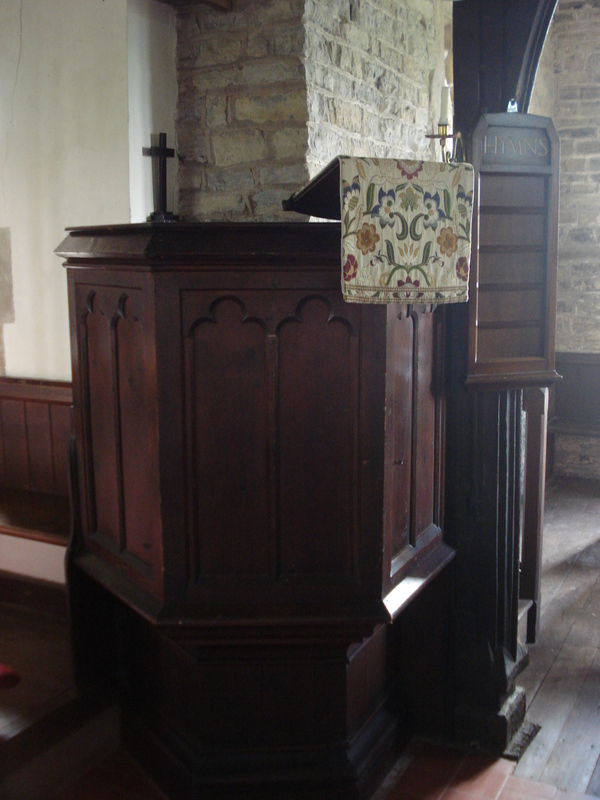 The hour-glass holder placed towards the front of the church enabled the preacher to time his sermon. The Galton family is remembered on the brass plaque on the south wall of the nave, which, originally erected in Hadzor church, celebrates the life of Robert Cameron Galton, the youngest son of John H Galton, the lord of the Manor. During the twentieth century, the church was kept in good repair, with electric lights added on metal stands in keeping with the character of the building affixed to the ends of the pews and electric infrared heaters fitted to the ceiling. By and large, however, the church retains its original form and character. One can almost imagine a seventeenth-century priest looking down from the pulpit to begin his sermon. In 1970, Hadzor church, to which Oddingley had been annexed in the nineteenth century, had to be closed. 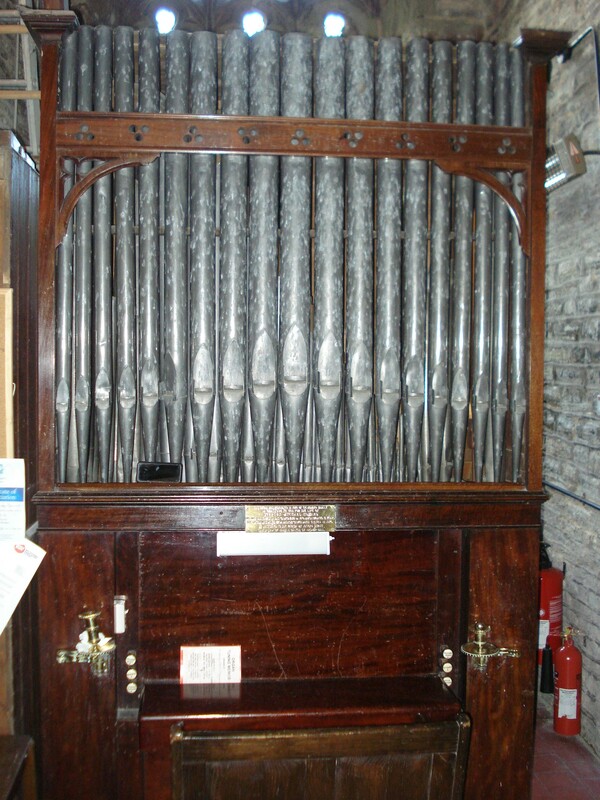 The organ from Hadzor was hence moved to Oddingley, and now straddles the space between the tower and the nave. Other items of historical interest in the church include a fifteenth-century chest and the Hadzor Church St James Bible. A fascinating story of nineteenth-century murder and treachery surrounds Oddingley church. To delve a little way into this darker aspect of the church's history, read on about the Oddingley Murders.